Board President Monica Garcia and Vice-President Nick Melvoin both make reference to a Rules Committee that has not held any public meetings. Where is the transparency? According to Melvoin, the committee is supposed to present proposed new rules to the Board at the end of this month (before a representative for Board District 5 can be seated), but the official calendar does not show that any public hearings have been held by this committee, nor have any been scheduled. This committee has not released any agendas or minutes from their meetings. Therefore, the public has no idea what is being discussed by Melvoin’s group or what entities are presenting information to them. Much like Superintendent Austin Beutner’s plan to “Reimagine” the LAUSD, this rewriting of the Board rules is devoid of any transparency. Melvoin’s position at the head of this secretive committee should be of great concern to anyone who believes in the importance of open government. At last week’s Committee of the Whole meeting, he suggested that the Board could “streamline” meetings by delegating more power to the unelected Superintendent. He has also backed away from his statement last week that his “office would be happy to look at [the changes” suggested by the “Board Meeting Accessibility to the Public” resolution and instead made light of the issue with the statement that people complaining “about how they won’t speak at our public meetings while they are speaking at our public meeting.” This statement ignores the fact that the discussion only occurred because it was forced on the agenda through the use of the state education code and that he personally delayed compliance with the request for six months. Melvoin also distorts the purpose of the resolution as it was clearly written to give broader access to the Board meetings for all stakeholders, not just those who have the ability to attend during the school day. Having the public express themselves to the elected School Board is clearly not a priority for the leadership that was installed by charter school industry supporters. 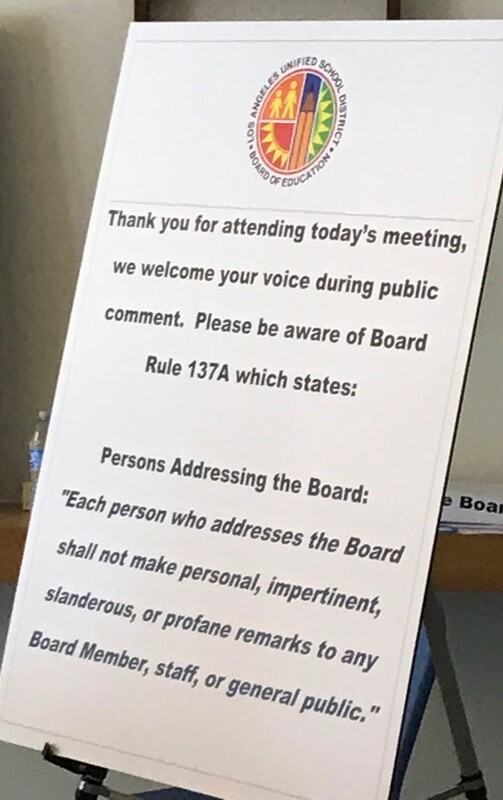 While Board meetings are subject to the Brown Act and require that general public comment be heard, Garcia has declared that she can ignore this requirement if she declares a meeting to be “special.” When speakers dared to work around this rule to speak against defunding elementary school libraries, she warned that they must “constrain their remarks specifically to the item or items” or they could be ruled “out of order.” Signs are now posted in the Board Room warning those who address the Board that they “shall not make personal, impertinent, slanderous, or profane remarks to any Board Member”. Members of the public are also prevented from bringing any signs into the room. The Board Members who put these rules into place are not the type of representatives that can be trusted to write additional rules behind closed doors.